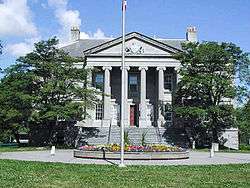 The Newfoundland and Labrador House of Assembly is one of two components of the General Assembly of Newfoundland and Labrador, the other being the Lieutenant Governor. 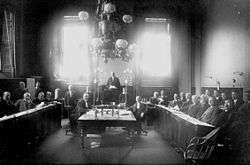 The Newfoundland and Labrador General Assembly meets in the Confederation Building at St. John's. 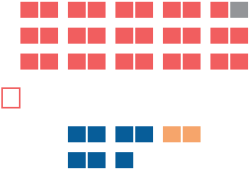 The governing party sits on the left side of the speaker of the House of Assembly as opposed to the traditional right side of the speaker. This tradition dates back to the 1850s because the heaters in the Colonial Building were located on the left side. Thus, the government chose to sit in the heat, and leave the opposition sitting in the cold. Cabinet ministers are in bold, party leaders are in italic, and the Speaker of the House of Assembly is designated by a dagger. ↑ "House of Assembly". Newfoundland and Labrador House of Assembly. Retrieved 2013-09-19. ↑ Newfoundland Act, 12-13 Geo. VI , c. 22 (U.K.), Sch. 1 (Terms of Union) s. 14 .